And so we invite you to go on reading as we are going to discuss the flipside of using water softener systems in today’s article. There’s no such thing as a perfect water softener, because if faultless water softener systems exists, then the internet wouldn’t be flooded with criticisms and complaints. Yes top brands and softener manufacturers would always look for ways make sure that they produce the best quality of water softeners for general use, but issues are bound to emerge one way or the other because of certain factors that can affect the overall efficiency of the softening process. As a wise consumer, you must understand that water softener systems are intricate devices. And like any other machine or appliance, they too have the tendency to mess up after a period of use. And though water softener companies are always ready to provide customer support, you can’t deny the fact that fees are also required in order to avail their technical assistance (yet, it would be wise to contact them if you are not sure about your DIY solution especially if the product warranty is still in effect). There are certain cases where a homeowner was able to purchase the correct water softener device, but still failed to use it properly either because they failed to follow the instructions correctly or may have neglected on testing the level of hard water in their area first and therefore rendering the device to be “ineffective” in producing soft water. How To Deal With It: The only way to solve this issue carefully read the instruction manual first. We know that some people choose to skip this part because they feel like their intelligence is being underestimated. But if experts are following the procedure every single step then why wouldn’t you? On the other hand, if you are uncertain about the level of hard water in your area then you should make it a point to secure a testing kit and analyze the hardness first. This incident happens to salt-based water softener systems when a slab of salt crust forms on top of the solution inside the brine tank. If your water softener is working and yet the quality of soft water is questionable, then it’s most likely that the salt bridge is impeding on the softening process. How To Deal With It: Though the issue sounds a bit complicated to deal with, the fix is surprisingly simple. 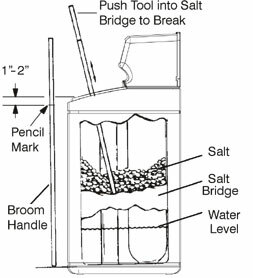 All you need to do is get a broom or any kind of stick that is long enough to reach the salt bridge and use it to break down the salt formation until it is completely disbanded. One thing you have to keep in mind though is that once a water softener has already gone through a salt bridge issue, it will happen again. So to prevent this from ever happening, we recommend that you clean your brine tank every now and then. Judging from the nature of the issue, you can already picture the problem in your head. And you simply can’t avoid experiencing this since you are using a device with flowing lines. How To Deal With It: Instruction manuals would always include step by step instructions on how to fix clogged areas in specific models. So keep your manual in handy for possible situations like this. Other than that, you can also address the matter to the water softener company as issues like these are covered by warranty. Just make sure not to do anything stupid that might cause the warranty of the product to be cancelled. Another aspect of water softener systems (at least for most conventional units) that is likely to malfunction is the motor. And just like any motorized appliance or vehicle, they are susceptible to mess up at some point. How To Deal With It: The first thing you have to do is to check on the wires and cables if they are still properly connected. It would really help if you have a background on electronics while doing this because you can proceed to the knotty steps after dealing with the initial inspection. If you find out that the motor is needed to be replaced, then you must evaluate your options first if this move will be more feasible against buying a new water softener. Did you find this article on “The Flipside Of Using Water Softener Systems” to be helpful? Which of these issues have you experienced already? Let us know by sharing your answers in our comment section.